The Splendid Sampler HAPPY 50! The Splendid Sampler is now, like me, FIFTY! The halfway mark is upon us and some of the designers have decided to celebrate with highlights of the blocks we have made, some with have tips or free projects and some giveaways! To date, I am a little behind for all 50 blocks but here are the highlights of the blocks I have made so far. I am sure I have made a few more but I could not find them in my photos. It is interesting to see the project transform from the first weeks to now. If you have not been sewing along with us, please come and join in the fun! There are still FIFTY more blocks to make and many of the blocks that have been released are super fast to complete! Catching up would be fun! 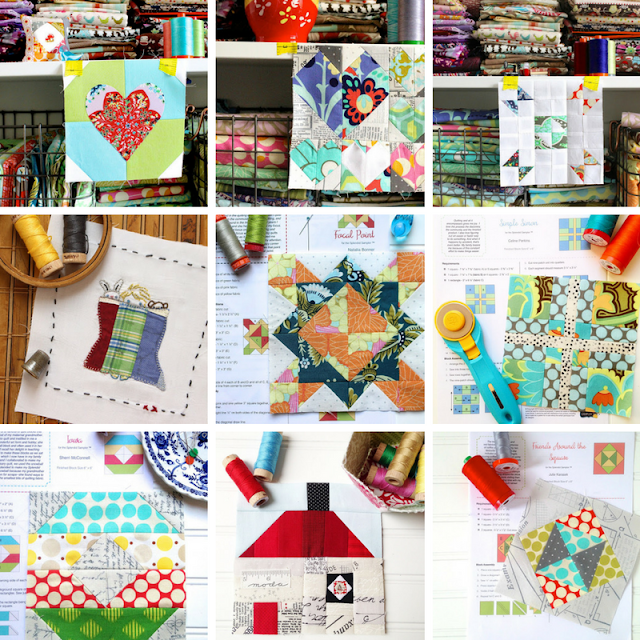 You can get your free block downloads by visiting The Splendid Sampler. These other FABULOUS designers from The Splendid Sampler are also celebrating this fantastic event! Make sure to stop by their sites see what they have in store for you today! I am hosting a little giveaway in celebration of all of the great work I have been seeing from so many participants! You are al doing a GREAT job with colors and trying new techniques but mostly for being such wonderful and supportive quilting friends! One very lucky winner will receive a sample set of Aurifil threads and three (3) gorgeous mini charm packs from Moda Fabrics! The giveaway is open to all of my international friends! The giveaway will close 09 August and the winner will be announced on or about 12 August. I love making a variety of blocks - mostly pieced and embroidery, especially redwork, but I am now venturing into the world of English paper piecing. I like it because I can sit with my husband as he watches sports and I'm spending time with him. Thanks for the giveaway! Love your bright colors! I'm learning lots from this sampler, and enjoying paper piecing. I love hand piecing blocks, also epp! I've always pieced blocks, but am quickly becoming a huge fan of Paper Piecing! I like paper piecing and applique. Oh the way you photograph your blocks is wonderful. I normally can never be bothered too much but seeing your is an eye opener! Hello , I love your choice of collors and I am new to quilting. paper piecing and some embroidery. But I am learning everytime more aldo it takes me some time. In the beginning I didn't like the paper pierce blocks but its getting better everytime. Love your work! Thanks for providing this giveaway and participating in the splendid sampler! I like to to different types of blocks, but my favorite is pieced ones. I love your color choices. So bright & pretty. I am learning so much making these cute little blocks. Love your SS blocks and how you photograph them! Thanks for a chance at the giveaway! I am so loving this journey and love all the applique blocks! Oh, my favorite blocks to make are pieced blocks, but this sampler has introduced me to appliqué, which I didn't think I would enjoy...but actually do! I love embroidery - it lets me slow down and think a bit. I've enjoyed all of the blocks. But without question, the embroidery has been my fav. I haven't embroidered in many years and it has been so much fun getting back to it again. I enjoy the piecing blocks, I have to say the embroidery blocks have awakened a love of embroidery. Love your ideas and projects. I fancy piecing with a mixture of applique. Just learning to applique....sigh.... Yep, it is a struggle. I love your colors on the Sampler. Bright and not so matching. Great inspiration!! Your Splendid Sampler blocks are fabulous! This is such a fun "party". What a lovely collection of blocks! About the time the sampler hit nine blocks I considered joining, but I am so very far behind on my to-do list of quilts as it is! I love the pieced ones however through this project have learned to paper piece, which I am enjoying! Pieced blocks are my favourite, but I've enjoyed embroidery, too. Lately I have been into hand stitching and applique. Thank you for the giveaway. I love pieced blocks, I enjoy the paper piecing as well. This has been a great sampler. I've learned so much and continue to acquire new skills with each block. My favorite method is normally piecing, but in these very small blocks with lots of pieces, paper piecing is catching on! I am a fan of needle turn applique' and use it to complete all the Sampler applique' blocks. I love piecing because it is easiest for me, but my favorite block is always the one being done with the newest technique I am learning. I love to learn! I found that I really like paper piecing. It is easy and accurate. I love the variety of techniques being used in this journey. Thanks for the chance to win the giveaway. I like hand piecing. But against my first impression, I have started to really enjoy blocks featuring embroidery. P.S. Kim, your photography showcasing your blocks is AWESOME! I love the trinkets and baubles and tools and toys (and the pokemon card!) I just called over my 14 year old art-loving daughter, and we spent time going through each picture and admiring the choices you used. Super cool! Thanks for sharing! Right now, I am enjoying embroidery/pieced blocks. I really like pieced blocks. I'm having SO much fun with The Splendid Sampler! I've gotten a little more comfortable with paper piecing, but haven't gotten the embroidery bug yet (though I was hoping this would happen), so I've skipped most of those blocks. And I don't feel guilty about the ones I haven't done, because I ADORE the ones I have done. What a fabulous project this is so far! And you're doing great - love your colors. Thanks for the giveaway. I am torn between pieced and appliqued as being my favorite method - but I adore miniature blocks of any kind. Love the blocks you have already completed. Can't wait to see the finished product. Always love your photos, so fun! I'm really enjoying the paper pieced blocks, though those small pieces can get frustrating! I just love how all the mismatched pieces of fabric come together! Loving the way you photograph your blocks...so much color! I'm loving this group! This sampler is great because I am learning new techniques. I love paper piecing now. Never really wanted to try before, but love it now. For the most part i like a pieced block but i do enjoy applique and embroidery as well. Love making pieced blocks! My absolute favorite! The sewing machine has been my favorite finished block so far. They are all fun, some challenging, but my sewing obsession started with my grandma's treadle machine. That block evokes the most pleasant memories...Thank you to all the designers! Pieced blocks are my favorite but I have been doing a lot of applique and embroidery lately. I love pieced blocks the best and working my way into enjoying paper pieced blocks for the accuracy and sharpness. my favorite block to make is the log cabin. Pieced blocks are my favorite. 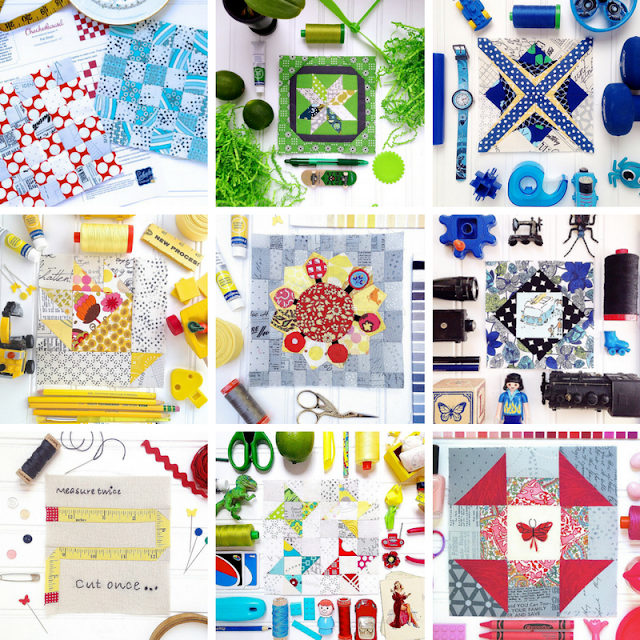 I love your colour collages! Congrats on being halfway. I love paper piecing and pieced blocks, my dream is to get better at both. Love your color collections on the photos and how the blocks look so inspired by those collections. Thanks for everything with the splendid sampler and the opportunity to win. Thank you for your contribution to Splendid! I think piecing is my favourite, although I am learning to appreciate appliqué a bit more. Just love your block colors! Super sassy and visually appealing! I thought piecing was my favourite but doing the Spendid Sampler has been great as it keeps it interesting with the different techniques. Not much of an embroider but really enjoying those blocks too. Love the applique too. Totally piecing... churn dash are faves! I think paper piecing is my favorite. Love your blog and fab Instagram photos! I love paper piecing. I took a class from Mary Fons last year and it's wonderful. Especially for someone who can't sew a quarter inch seam if her life depended on it. My favorite has always been pieced but I've fallen in love with the paper piecing blocks! Your blocks are great, I've loved learning new techniques along the way. It's going to be a beautiful quilt when it's all finished. Thanks for all you do! I love piecing but am intimidated by paper piecing! Paper Piecing. I love the precision that comes from it. I have got to get back into quilting!! I've been knitting and have had a wrist injury so have not done much sewing. I am getting psyched to get going again though. I have loved beautiful fabric since I was very young. I used to play fabric shop (when I was supposed to be going to sleep) with the double wedding ring quilt my Nana had made and was on my bed. I love quilting and especially the Splendid Sampler sew a-long - I like pieced blocks the best but also like applique. Thanks for being part of this. I imitated your 'candy' block - it suited my fabrics perfectly. I love to piece my blocks! I'm okay with other methods now and then but piecing is my most favorite. I am enjoying the Splendid Sampler. I have been quilting since the early 1990's and am enjoying using all the skills I've learned along the way with a few new tips and tricks here and there. My favorite block is the Dresden Plate....because it's traditional, it can be contemporary/artsy, involves piecing and hand or machine applique. It's my favorite handwork. Me encantan los bloques bordados y los de pieceo. Estoy descubriendo el paper piecing. What a great giveaway. Thank you for all of your hard work! I really dig the color schemes in your photos. Too cute! So much fun to see all your blocks, wish I had chosen some of your color combinations. My favorite blocks to make are anything that forms a star. Pieced blocks are definitely my favorites. I would still call myself a beginner quilter, and find piecing the easiest to do. I did really enjoy the applique though when I tried it. Thanks for your funny sense of humour and love of quilting that you share so generously with us. I like to piece or do fusible applique. I've done enough paper piecing to be comfortable with it but the potential fabric waste kills me! I like blocks that are pieced, needle turn appliqued, embroidered, embellished, and look forward to trying new techniques! I prefer to piece my blocks but have been wanting to get back into doing embroidery. I love applique, EPP and embroidery - and I'm learning to like paper piecing more and more, thanks to this QAL! Thank you for being a part of this 50th Splendid Party. This is just so fun to be involved in making so many different blocks. Such a fantastic and well-organized journey of such many talented designers with their creative blocks. AND it is ours to have forever! Sorry I was just excited about this party. I enjoy pieced block and I love the 9 patch. It's been around for a long time and you just can't go wrong with this block. So versatile and it is one of my favorites. I follow your Go-Go Life on FB every since I saw your block. I love your style. Thank you for the opportunity to win something special. I love your colours and seeing the sample blocks each time a block is released is very inspiring in terms of the options for each block and how you can out your twist on it. Looking forward to the next 50 blocks. I had never made a paper pieced block until the Splendid Sampler. Now that's my favorite kind of block to make -- no measuring is wonderful! This has been such a fun program, I love to see all the artistry that the quilters bring to make their blocks unique. I am a long time quilter but I have learned so much. I love the variety and I am making a true scrap quilt. Thank you! My favorite block is the sawtooth star, pieced I just can't get paper piecing yet. I like a variety of blocks but piecing and applique are two of my favourites. Piecing any block is my favorite, but I also do applique and paper piecing. Lucky I saw this on IG, I have been following you, but this did not show on my blog feed? Any suggestions? Hi Krista! Thank you for being one of the SS designers! Your blocks look wonderful and I love all the colours! I'm having a Splendid blast doing this challenge and learnt such a lot from designers and participants. Cheers! Thanks Kim. Love your giveaway. I have been wanting to try the different weights of Aurifil thread. I have done 32 blocks and the pieced ones and paper pieced one are my favorites, although I am starting to like applique. I prefer pieced blocks but it's great to try a variety of techniques. I love the selvage block because of the different colors. This is a great opportunity to learn new techniques. Thank you. I like all techniques because the variety is what keeps me motivated and challenged, thanks for the chance to win!! Love the Splendid blocks and all the tips, hints and stuff. Thanks for participating in a give-away. I like piecing, applique and paper piecing. I especially liked your block. It was a perfect way to review paper piecing. Pieced blocks are definitely my favorite but I have done some paper piecing and plan on doing more. I am planning on some applique to keep my hands busy while on an extended cruise. Keep your fingers crossed for me. Your block photos are very nicely set up and shot! As for your question, before The Splendid Sampler I didn't have much experience. Now that I have tried several techniques I would say paper piecing is rapidly becoming a favorite quilting method. However pieced method is my favorite. I am enjoying making all the different kinds of blocks. I really love the embroidery and foundation piecing blocks and am slowly getting the hang of applique! I love piecing, paper piecing, and applique. Embroidery is the one thing that slows me down. Your blocks are awesome - so colorful and fun! I am amazed at how much stuff you get done!! Thanks for the inspiration! With all the different techniques it is hard to choose, I am liking paper piecing, and embroidery. I started the sampler, but have gotten sidetracked! Time to refocus! Love your collage of your blocks. So far, I've completed 25 of the sampler blocks plus 3 bonus blocks. I got a very late start and then got delayed by life events. Sometimes, I like an easy block to help me catch up, but usually prefer the unusual unique blocks like the flip flops. I like all the blocks. Some are hard but so rewarding when finished. Love your blocks. Thoroughly enjoying the journey of the Splendid Sampler. Thanks for the give away. Love your sampler block photos. I make the pieced blocks and have made some of the appliqué ones. Paper piecing is out of my comfort zone still! Thanks for the chance! My favorite blocks to make are paper pieced stars. It is the only way I can get sharp crisp points on them! I also love drunkard's path blocks because you can arrange them in so many different ways. Love the pieced and applique blocks. The paper pieced blocks have always intimidated me. This has been a great opportunity to "step out of my safety zone!" Love your colors and style. I like the easy to piece blocks, also embroidery is always a treat to me! I've always liked pieced blocks and thanks to the Splendid Sampler, I've tried many other techniques. I like paper piecing more than I thought I would. Embroidery is tough for me as I never hand sew, but as long as I watch a video or read about the stitches before doing them, I've been okay with it, just slow. I love all things quilty in the way of blocks, but by far my favourite is pieced. I've enjoyed the embroidery blocks! I have enjoyed trying a little bit of a bunch of different things. I actually prefer to make pieced blocks/ But, sometimes I will throw in an appliqué d block! I like applique, much to my surprise. 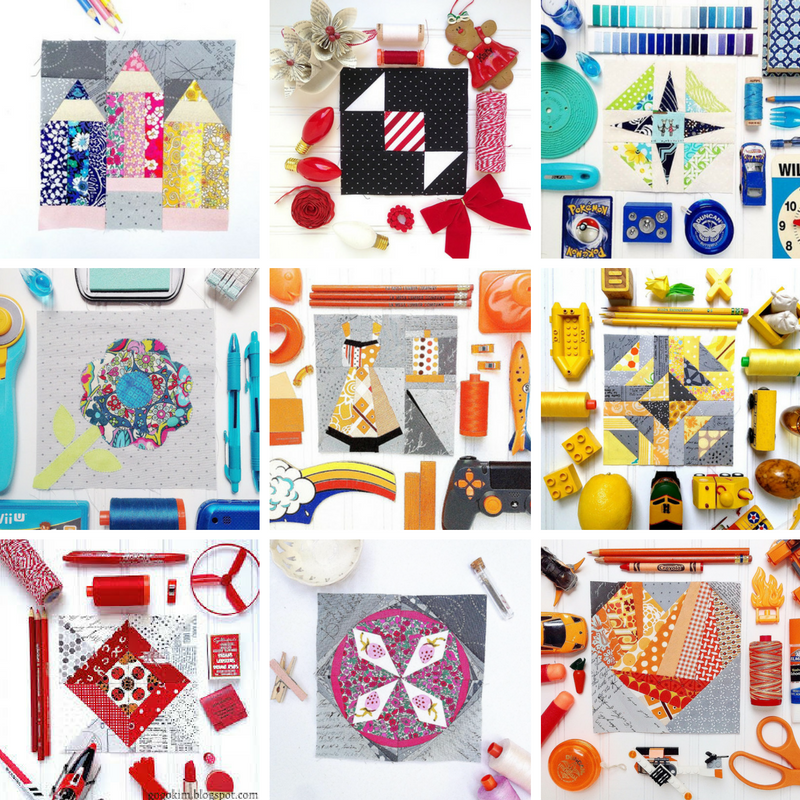 I like the challenge of paper-piecing and it seems that I like blocks with many tiny pieces. My favorite is piecing but i am enjoying rediscovering hand embroidery. I love the hand work and that is followed closely by piecing. I enjoy making different blocks, but my favorite is piecing. I have never done paper piecing before the splendid sampler, and now I love the challenge of it. Thanks for a great give away! What a sweet prize. Love the colors you are using on your blocks. I really enjoy the embroidery blocks but I did love learning paper piecing and hope to practice it more through the sampler! I am doing several quilt-alongs including the Splendid Sampler and wishing for more hours in the day so I can be closer to being caught up! Your prize offer would be very useful. Never seem to have enough thread on hand - or the right color, and I have not yet used the packs of little squares. I'm having so much fun sewing along with the Splendid Sampler! I have really enjoyed learning the paper piecing. My favorite is a pieced block with paper piecing running a close second! I am so enjoying this journey. It is a great learning experience. Thanks to all the designers. My favorite blocks are mostly pieced ones with a touch of applique. I'm most comfortable with the pieced and embroidered blocks but am enjoying being stretched to learn new techniques. Paper piecing with tiny slivers was a challenge. I do like the paper pieced blocks. Thanks for the giveaway. Love your color choices! Thanks for participating. This will hopefully help to expand my capabilities. I like to do hand applique and embroidery. I've learned to do paper piecing so much better since the Splendid Sampler has so many paper pieced blocks! I've also been watching Alyssa Thomas paper piece and picked up some great tips! I love the photographs of your blocks. I prefer pieced blocks, then applique but hate paper piecing. Great to see all your blocks. I am really enjoying trying all the different techniques in The Splendid Sampler. I really enjoy trying out new techniques and mixing it up but piecing blocks is my favourite !! Pieced blocks are my favorites; I'm leaning toward improv piecing these days. I just "found" you on instagram. Love all the sample blocks! I especially like making the appliqué blocks. For the Splendid Sampler I love using fabric colors out of my comfort zone. Thank you to Pat, Jane and all the designers ! I love doing embroidery and incorporating the blocks into pieced quilts. Sometimes I just make up my own pattern to go with the embroidered blocks. I am all about pieced blocks, but applique makes a good second :). I love to paper piece, but am finding all the other types of blocks fun as some of the techniques I either haven't tried before or haven't done for a long time. Thank you for this great celebration give away! I really enjoyed this journey, but I am in love with applique and embroidered blocks the most! The Splendid Sampler journey is so much fun. I'm just amazed by all the wonderful sharing and kindness that is going on between thousands of quilters the world over. I'm behind in my blocks but I just don't care because I'm having so much fun. Thank you to everyone who made this possible. This has been a fun sampler to follow! I have always loved to do hand embroidery. My mother taught me when I was very young, starting with napkins & dresser scarves. I f I see embroidery on a block-I'm hooked! I like pieced blocks. Rolling stone is a favorite. Love the combo blocks my favorite - block 11, crocheted thoughts. Piecing and paper piecing oh, and applique are all fun to do. The ones with extensive embroidery have been my biggest challenge mostly because I am so self critical. I swore I would give my best to every block, but I have been putting off a few because I feel a bit intimidated. I am hoping I can find someone local who is doing this sampler who might be a good embroider and will encourage me! lol The other great challenge is picking out the fabric. Sometimes things you think will look fine together...well, not so much! haha... but that is part of the process as well, right? I love paper piecing, it took practice to become comfortable with it but is now one of my favorite methods. Thanks so much for your sharing and encouragement, this sampler is my favorite because of the versatility anticipation and fun I am having. This is my first block of the month experience, and I am having a wonderful time. Thank you for your contributions to our Splendid Sampler experience! If I am to choose a favorite block, I would have to say the 'Inchy Hexagon' block. You have great blocks!. Your fabric choices provide a lot of "zing" to each one and I am wishing I had gone with more vivid fabric choices now. I love the embroidery touches....it makes my mind more creative in the process. Love your blocks! I am a new quilter so learning all different things. Do I have a favorite technique? I like doing some more...paper piecing as an example but love the impact of others....applique. I find that my skills are getting much better. Still working on color choices. Quilty hugs back atcha! I actually love all methods. Making many of the same machine pieced blocks is very boring to me, so I'm loving the variety in Splendid Sampler blocks!! This is so much fun! I love the excitement of waiting to see what comes next! I love the applique blocks! I love the beautiful colors in your blocks. I have fell in love with paper piecing since starting TSS and now am doing the Farmer's Wife paper piecing blocks. My applique is also improving from being a part of this quilt along. I love the way you style your blocks for the photographs! Since you said this is for international folks, I guess those of us "domestic" folks shouldn't be blocking up your comments areas. But, hey, who are we to follow directions! We just love a good blog! Love your photos, too! I like hand applique. Any kind of flowers, fancy leaves, etc. English paper pieced blocks are my favourite thing to make n assemble..
Yeah, Fifty! I always look forward to seeing what colourful picture will be used for each of your blocks. - I am holding back on the appliqué blocks until I have improved my skills. All in all - I am learning a lot, and my skills are improving. You can certainly tell my earlier pieced blocks from the more recent ones.